The Journal of Conservative Dentistry, which is the official journal of the Federation of Conservative Dentistry of India, was founded in 1998 to serve as a portal for dissemination of knowledge in the field of conservative dentistry and endodontics in India. I would like to place on record the excellent support and help given to me by my Associate Editors, Dr. Krithika Datta and Dr. Nandini Suresh. The role played by our eminent Editorial Board and Reviewer Panel is commendable and is instrumental in improving the academic output of our journal. 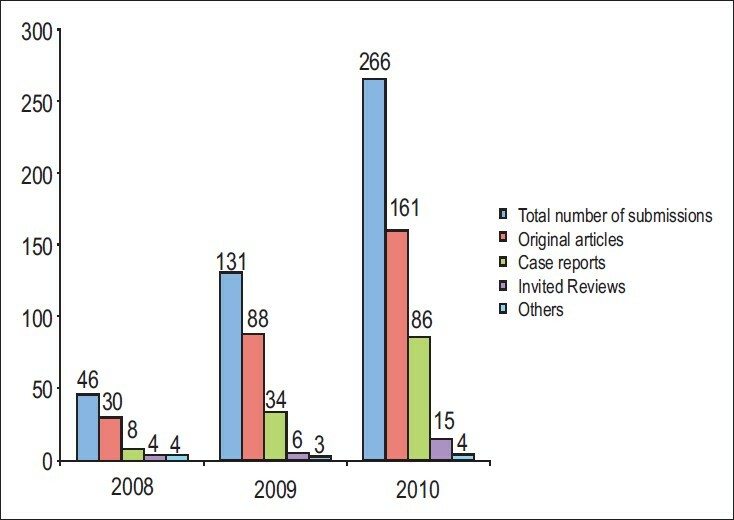 The growth of our journal has been momentous and truly commendable which can be gauged by the sixfold increase in the article submission rate in the past 3 years [Figure 1]. This can be attributed to the growing awareness of the presence and quality of our journal which got indexed with PubMed  ;. 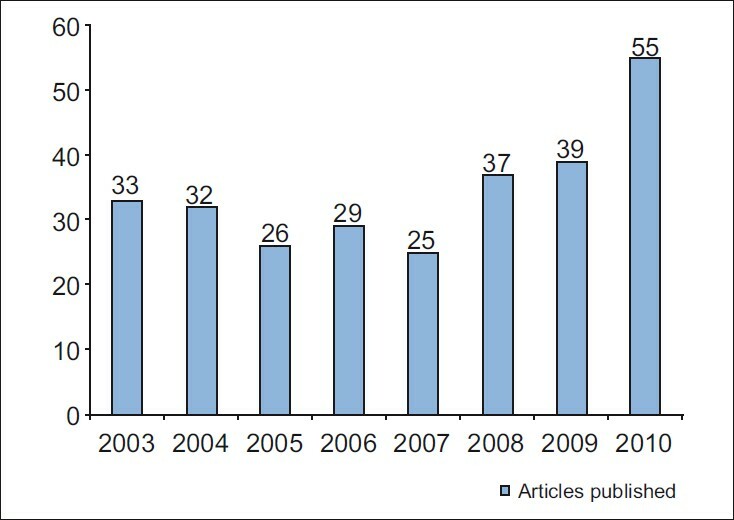 In order to accommodate this spurt in submissions, we have increased the number of print pages as well as the number of articles being published [Figure 2]. We have also witnessed a steady growth in the number of institutional subscribers of our journal reflecting the role played by our journal as a benchmark for research in our specialty in India. The 25 th National Conference of Federation of Operative Dentistry of India (FODI) is being held at Chennai in December 2010. On this occasion; it gives me great pleasure in bringing out this special issue to commemorate the silver jubilee celebrations of FODI. This silver jubilee issue comprises of invited review articles on important clinical and exam-oriented topics. The invited authors include the previous editors of our journal along with the leading academicians from across the country. We have also added a research article, which highlights the contribution of Indian authors to the world endodontic and conservative dentistry literature in the past two decades. We have already started getting article submissions from countries such as Brazil, Turkey, Iran, Malaysia, Pakistan, Japan, Senegal, Syria, and Poland. Our efforts would be to make Journal of Conservative Dentistry, a globally recognized journal with an international content and reach. We will strive to make J. Conserv. Dent. the premier resource journal of our specialty in Asia by 2015. As an immediate measure, we will increase the number of pages of our journal to 100 pages per issue in order to accommodate at least 25 articles per issue and to have an average of more than 100 article publications per year from 2011 onwards. 1. Gopikrishna V. We have a dream…In pursuit of excellence. J Conserv Dent 2008;11;2. 2. Gopikrishna V, Datta K, Nandini S. Journal of Conservative Dentistry is now PUBMED indexed. J Conserv Dent 2010;13;1.